A fraktur experiment, based on the roots of western type which can be traced back to the scriptoria where monks copied religious texts. But monks were only mortal men, their calligraphy could only reach as far as their tool, the broad nib pen. This makes the truth undeniable: Divine beings such as angels are better calligraphers than man. 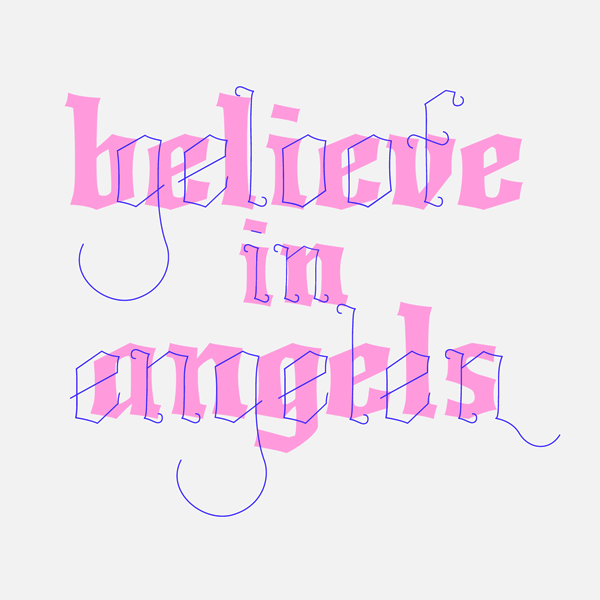 So how would angel calligraphy look? Would they use entirely different lettershapes? I concluded that angels had to communicate with their flock, so the basic letters would be the same. However, the forms would be able to expand and contract on demand, without any technical limitation. The typeface has various weights, ranging from extra-heavy to the ornamental extra-thin 'angelhair' weight. A multi-weight fraktur experiment, based on the roots of western type which can be traced to the scriptoria where monks copied religious texts. But monks were only mortal men, their calligraphy could only reach as far as their tool, the broad nib pen. This makes the truth undeniable: Divine beings such as angels are better calligraphers than man. However, the forms would be able to expand and contract on demand, without any technical limitation. The typeface has various weights, ranging from extra-heavy to the ornamental extra-thin 'angelhair' weight. This is an ongoing research.